June 20, 6 to 8 p.m.
“It’s the longest day of the year, so let’s celebrate the midway point of summer! 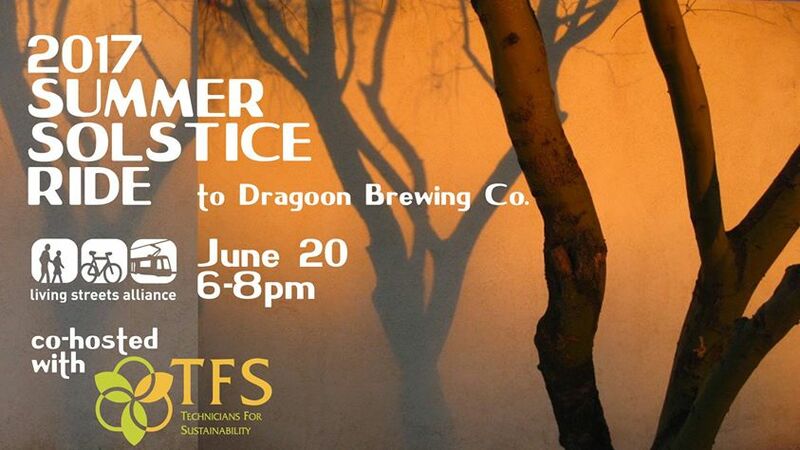 Join Living Streets Alliance and Technicians For Sustainability on a casual, friendly bike ride along mostly car-free paths to Dragoon Brewing Co. where we will enjoy cold brews, a food truck or two, some prize giveaways (including a solar battery charger from TFS!) and more. Come thirsty, and drink up! Dragoon will donate one dollar for every pint sold to LSA, this night only! Carolyn’s note: I know this is the summer solstice, but since excessive heat and a high temperature of 112 is predicted for tomorrow, please wear a hat, sunscreen, and bring lots of water with you on this ride. 2 dozen die-hards and a toddler showed up to ride this 3 mile one way route to Dragoon Brewery, along the Santa Cruz River. Spray guns, otter pops and lots of drinking water went with these brave folks, as I waved them off at 6:08 p.m. , in 110 degree temperatures. Happy Solstice in June 2017.